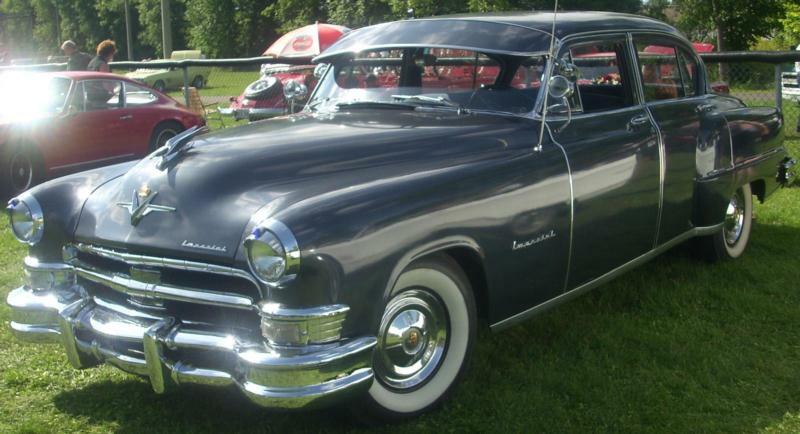 Chrysler was ready, willing and able to make the change from seller’s market to buyer’s market in the late 1940s, and the new cars were stylish with front fenders now flush with the body and rear fenders. Engines and drivetrains were essentially carried over, with a 323.5 cubic inch 135-hp flathead inline-eight. The transmission was called Fluid Drive, and sapped a lot of power away from the flywheel before it got to the road below 10 mph. It was smooth, though, and could be driven without shifting of gears while on the road. It had four forward speeds instead of the more normal three, set-up in two ranges. The clutch pedal was employed at any time that the transmission was shifted between reverse, power or driving. Chrysler advertised that 98 percent of the driving could be done in “driving” range. The transmission used a fluid coupling, which allowed the engine to idle in gear while stopped, much like a modern automatic transmission. In order to pass a slower vehicle, there was a kickdown switch under the gas pedal, allowing the transmission to downshift when the throttle was floored. All Chryslers had this transmission system as standard equipment. It certainly was smoother than a regular clutch and manual shift, and in this era quick acceleration was not yet a sales plus. No competitors had anything like it standard, and only GM had the Hydramatic automatic transmission at rather high extra cost. Packard’s all-new Ultramatic automatic was also introduced at high extra cost in mid-1949. The downside of early full automatic transmissions was that they could need a rebuild as early as 20,000 miles, whereas the Chrysler system was so robust that it rarely broke, and clutch plates virtually never wore out. Chrysler’s top-of-the-line New Yorker could be had in various body styles, including a four-door sedan, club coupe and convertible coupe. A long, easy-riding 131.5-inch wheelbase was employed. On the new second series 1949 cars, Chrysler’s all-new four-wheel disc brakes were available for an extra $400. This was very expensive, and was as much as 15 percent of the cost of the car itself. The 1950 Chrysler New Yorker carried a new grille, with a new Newport hardtop coupe body style added. Like other hardtops, this car used the convertible doors and side glass with a new metal roof. The 1951 cars were again restyled with a new grille, but the biggest news was under the hood. Using technology gleaned from World War II aircraft engines which utilized hemispherical combustion chambers, Chrysler engineers developed a massive new powerful V-8 for Chrysler, displacing 331 cubic inches. The new engine was rated at 180 hp, a full 45 above the previous inline-eight, and was attached to a new Fluid-Torque-Drive transmission which added a torque converter instead of fluid coupling for improved acceleration. This engine suddenly changed everything for Chrysler. The cars were suddenly appearing and winning on race tracks, and the horsepower race was on. As far as body styles, the New Yorker line was again expanded to include a new Town & Country steel-bodied station wagon, which was much more practical than the prior Town & Country woody station wagon line. Power steering was a new option, and with the heavy FirePower Hemi V-8 engine under the hood, it was pretty much a necessity. For 1952, the New Yorker line was truncated back to three body styles, which were the four-door sedan, the Newport hardtop coupe and the convertible. Grilles and trim were again new. 1953 New Yorkers were entirely reskinned and restyled, finally disposing of the two-piece windshields but retaining the rear fender outline. The New Yorker line was now on a 125.5-inch wheelbase, down six inches, and the body styles offered now again extended to four-door sedan, club coupe, Newport hardtop coupe, Town & Country station wagon and new eight-passenger sedan on an exclusive 139.5-inch wheelbase. Power remained at 180 hp for the third year in a row. Kelsey-Hayes wire wheels were optional at the cost of $300. A new Deluxe range of New Yorker was also added at about a $150 price premium for additional trim and equipment. Chrysler’s own Air Temp air conditioning system was newly optional at extra cost. 1954 brought about a power increase under the hood, with the big 331 cubic inch Hemi now belting out 195 hp. The New Yorker Deluxe engine power was up 50, now at 235 hp, due to a new Carter WCFB four-barrel carburetor replacing the Carter WCD two-barrel. Even more important was Chrysler’s own all-new two-speed fully automatic transmission (employing a planetary gearset) standard on the New Yorker. This brought Chrysler right up to date in all ways against the competition. People’s expectations began to move upward, evidenced by the New Yorker Deluxe out-selling the lower powered New Yorker. This was the last year the all wheel disc brakes would be optional. The 1955 cars would be all-new.